The past week Minnesota has been dumped on. I got a snow day on Monday, Thursday and now today! On days like this I like to pull out a quilt and curl up with some hand sewing or a new book. My favorite quilt that I like to curl up with is this quilt that I designed a couple years ago. I haven’t done much designing but that year for my birthday I got a Hoffman Bali pop and it was like inspiration hit. Ya know how in the cartoons when the lightbulb appears over someone’s head…yup that was me. I knew that I wanted to put applique flowers in the quilt, so I started doodling and came up with a flowered block. The quilt sat in my Unfinished pile for several years, but this winter I decided to finish it! To pamper myself I decided to put cuddle on the back. I was a little worried about quilting such a large quilt with Cuddle but it didn’t end up being that bad. I just pinned the life out of it, and used a Supreme Slider for the bed of my machine when I quilted. The Supreme Slider made such a huge difference! I have quilted two other quilts before with cuddle, a baby blanket and a lap quilt and I remember just having trouble with it gliding on the machine.The Supreme Slider helped a ton! After the quilting was done, I found that I had made the best decision ever! The cuddle was so soft I couldn’t wait to put the binding one before I used it! Now I use it all the time, it is my t.v. 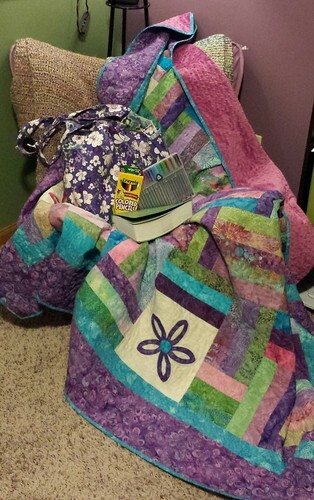 movie quilt, my snuggle quilt, and in the mornings my Jesus quilt when I pull out my Inductive Study Bible and dive into God’s word. One thing I learned while making this quilt is that Cuddle is kinda like carpet. It has nap. If you run your hand along it one way it will be a lighter color and if you run your hand the opposite direction it gets darker. And when you are piecing a back you want to make sure the nap is running the same way! You can kinda tell from this picture. The left side of the back is lighter than the right side. I didn’t notice this until the whole quilt was quilted and almost bound. It isn’t that noticeable though so I am gonna just shrug my shoulders and say “No one will notice”. Have you used Snuggle before? What a great quilt. I just so love Bali Pops and you used it beautifully. You have the secret to successful domestic machine quilting – pin the heck out of them. Congrats on your finish. Sounds like a perfect snuggle blanket! Thanks for linking up to TGIFF! No one would notice because they would be in nirvana from the softness and colors! I am trying to figure out the pattern, as I really like the flower blocks and random lengths.